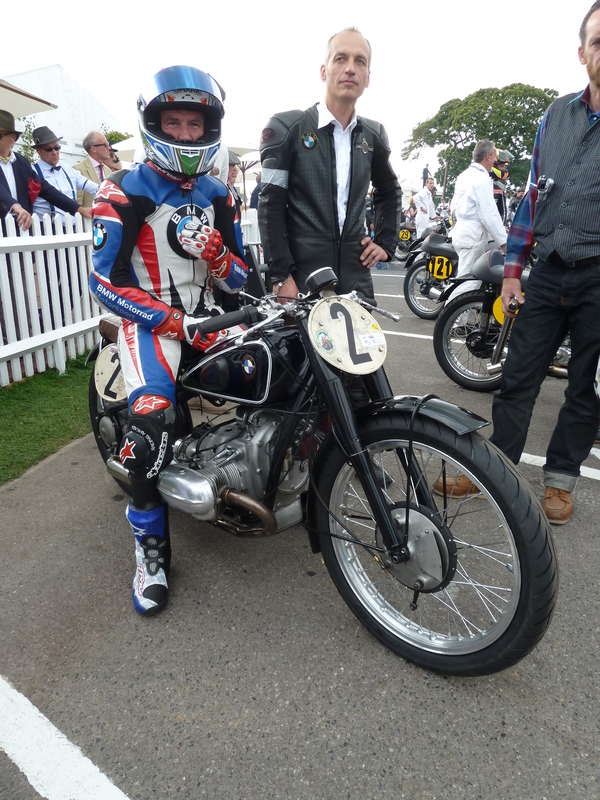 Facebook link to Kevin Schwantz’s Goodwood Revival photos. Marnie has done a great job of getting the style and mood of the event. The “off” on Friday practice put us out of qualifying when we were running 4th fastest and at the end of qualifying we were 9th on the grid of about 30. By race day Rodney had still not done a lap at race speed so the warm-up lap was it! Normally each pair of riders start first on alternate days with a minimum number of laps required for each rider. We got permission for Rodney to start the races on both days so he got the warm-up lap as extra practice. Both Kevin and Rodney had never seen the circuit before unlike most of the other competitors who have raced here lots. The Saturday race was hampered by the replacement footrest on the right hand side being the original length “museum type” checker-plate type and it was hitting the ground really hard. Rodney had a “moment ” when he was making an outside pass and had to take to the grass because the footrest was hard on the deck. When he handed over to Kevin on Saturday we had moved up a few places and Kevin went faster again, getting the bike up to 6th place at the chequered flag with a best lap of 1:36.483. By Sunday we had cut the footrest off shorter but the inner cone had fallen out of the megaphone because of the previous crash damage. I was concerned the riders would find a big flat-spot in the power band. With only 4 speeds in the gearbox the engines needs a wide spread of power. We had done lots of tests on Brett Robert’s dyno with Pete Welch changing cams and timings every day for a week until we found a good combination which seems to be as fast as anybody else. I was really not sure how we would stack up against the local bikes which have has a lot of development, but at the end of the Sunday race Kevin did the fastest lap of the weekend by a single cylinder bike, with only the Horner boys 1000cc Vincent from Australia faster. Kevin Schwantz did a 1:32.253 on the last lap which got us up to 4th place. 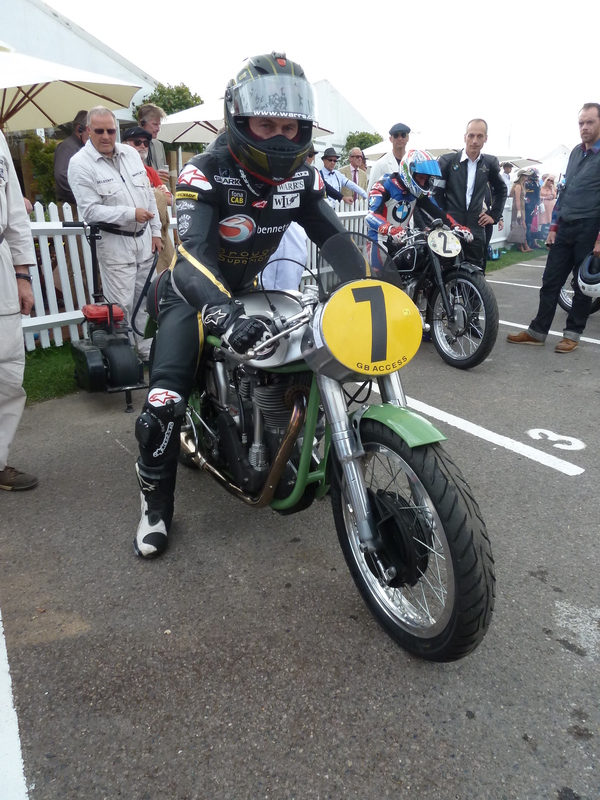 Rodney got to grips with the bike as well and his best lap on Sunday was better than Kevin’s best lap on Saturday. The bike never missed a beat all weekend, didn’t leak much and bar the crash damage, looked like new! Our biggest problem was just lack of practice time and experience with the bike that had never been raced before in 64 years! 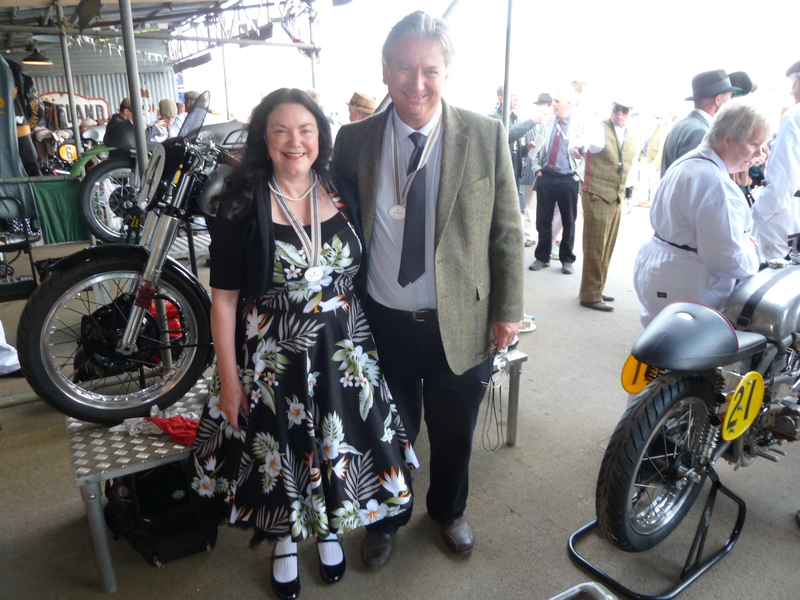 The public and many of the competitors were as delighted as we were for the good showing and the fact the bike was a “museum quality” restoration with all the original 1950 parts and still went faster than all the other bikes, bar the Vincent. The combined result gave us 5th overall. Both Rodney and Kevin said they had a ball on the bike and we needed a rematch tomorrow now we have it sorted. Kevin is as popular with the fans as ever and is a delight to work with. He is totally focused on doing the best he can and really wants to put a show on for the fans. He made himself available to sign autographs and always had a smile. We arrived at Goodwood yesterday after a few days catching up with John and Jane Surtees at their wonderful Manor House in Kent. The house dates back more than 500 years in parts. 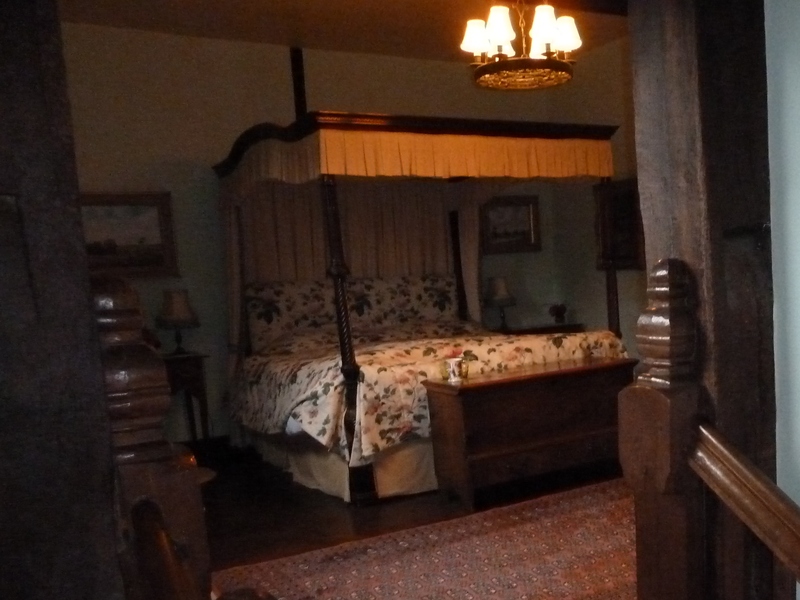 When we first met John during his visit to the NZ Classic Festival in 1982 he promised Debbie that if she coped with the early morning starts at Pukekohe, we could come to England and stay in his house in a “genuine four poster bed”. The bed is the biggest I have ever slept in and feels like a “featherbed”, but not the Norton type! Peter Bloore brought the 1950 “Works” Norton down for me to do final prep in John Surtees workshop and for John to have a look at. John has been most helpful with the supply of some rare parts and patterns to copy and has restored a number of “Works” Norton’s himself so he was very keen to see the finished bike. John kindly got his mechanic Ian (behind bike in photo) to take the bike down to Goodwod for us in his transporter, along with the World Championship winning Ferrari V8 Grand Prix car that John was demonstrating during the weekend. We met up with our riders Kevin Schwantz, who recently qualified well in the Suzuka 8-hour race in Japan ,(but didn’t get to ride when his team mate crashed out early), and Rodney O’Connor who came over from NZ for the event. Rodney had tested the bike at Pukekohe before we left and is an ideal co-rider for Kevin. 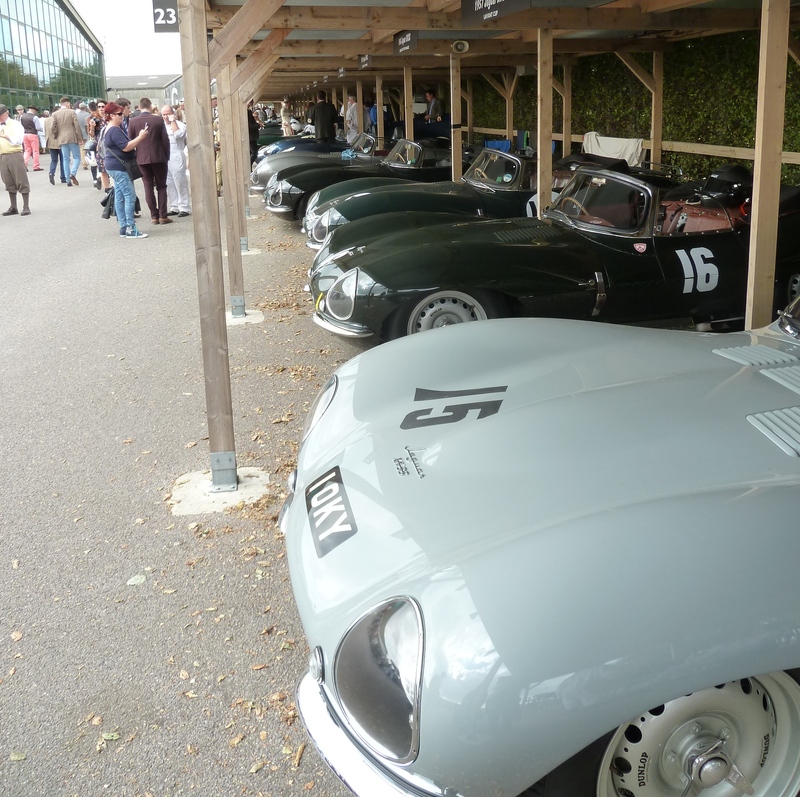 You are not supposed to have two professional riders in a team at Goodwood. Kevin turned 50 recently but looks really fit, and light. I had forgotten how tall he is, but he fitted on the Norton perfectly. 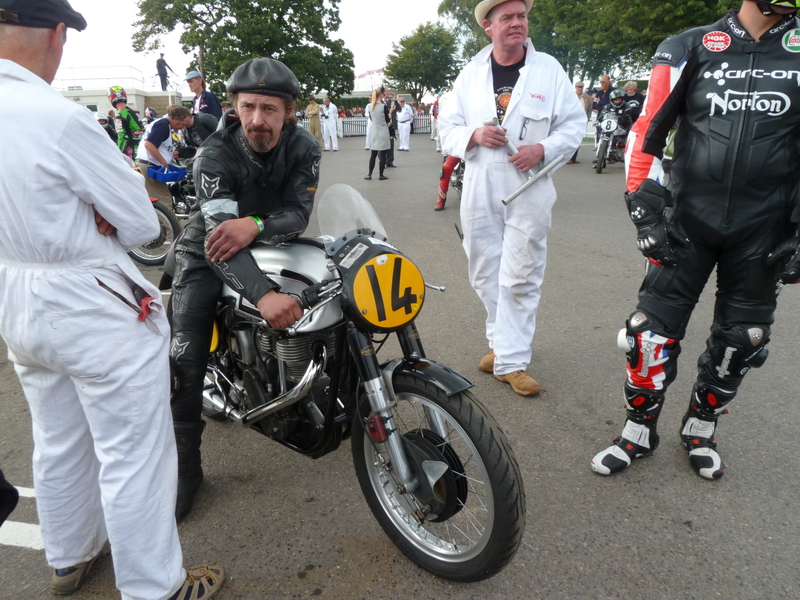 He had a nice set of black Norton leathers made for the occasion. John Surtees who turned 80 recently and Kevin Schwantz who turned 50 swap stories. 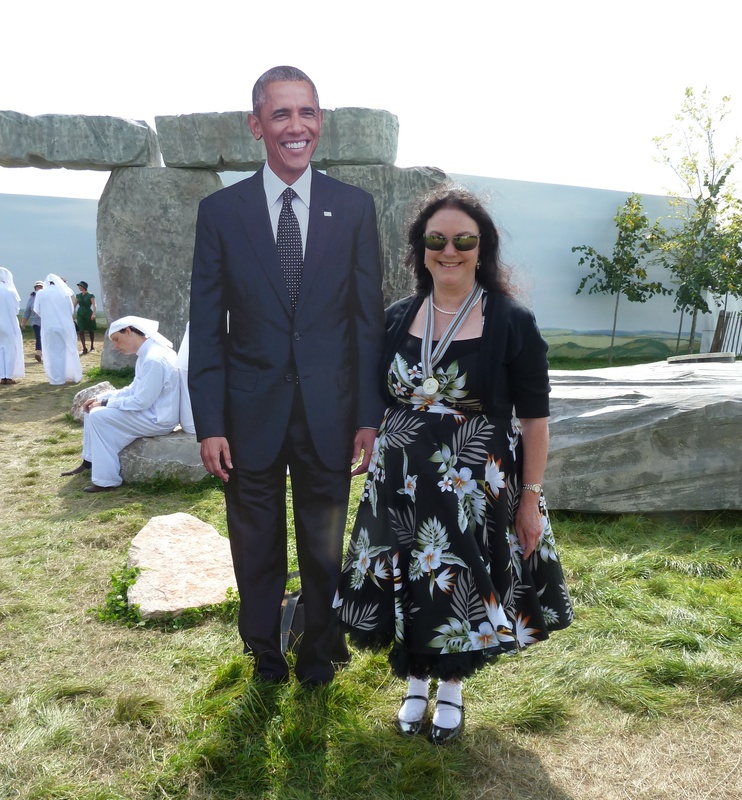 The event is absolutely huge with a crowd of 100,000 people coming, many in classic cars, and nearly all dressed in period costumes. Rodney in a full RNZAF uniform. I even wore a tie under my “Arkwright; Open all hours” style brown dust coat. The evening on Thursday finished with a cricket match in front of Lord March’s home, followed by a drivers briefing. This was preceded by a lone Spitfire doing an amazing display with a lot of runs over the cricket pitch at less than 100ft. Today we had more planes with a flypast of TWO Lancaster bombers with a bunch of Spitfires in support, and later a Canberra bomber with two Hunter jets in support. 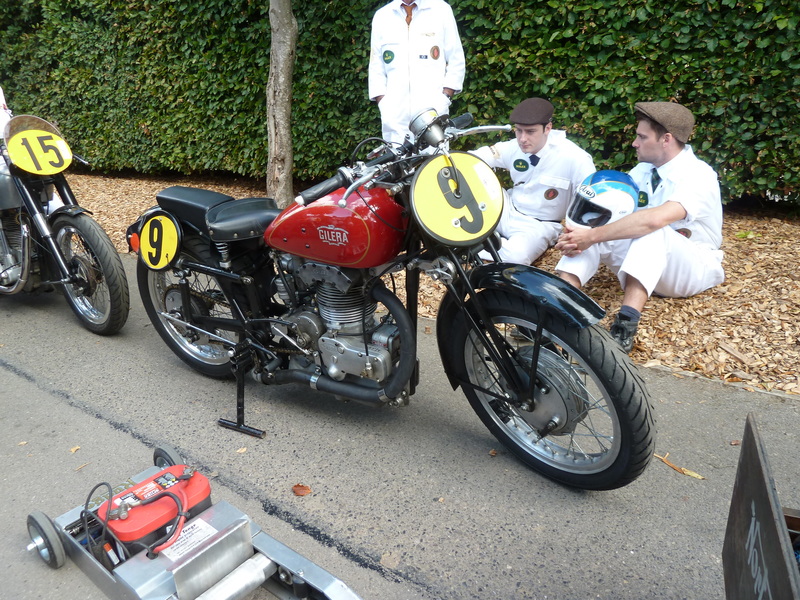 Around lunch time the bikes were called up with a lot of interest in our Norton. 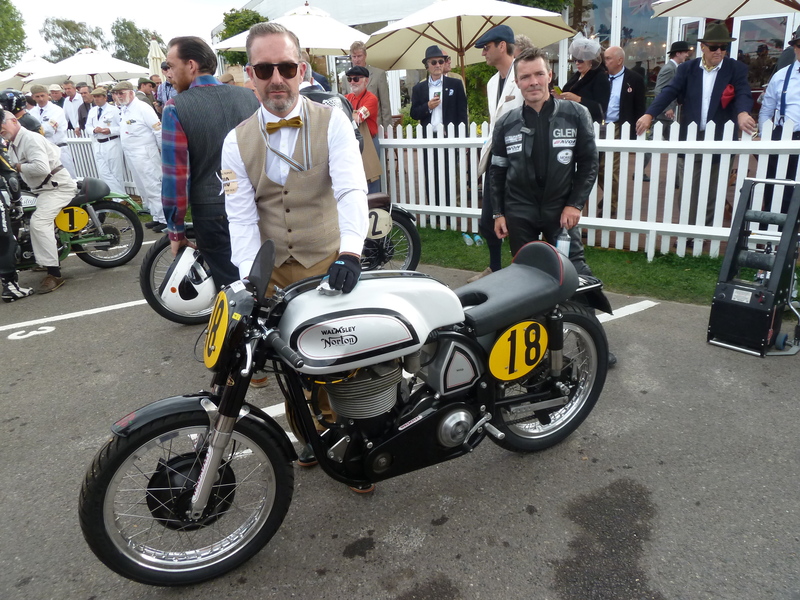 The Norton experts all came and inspected the bike and a lot of praise came our way for the determined effort in getting the bike so close to original specification, and then actually racing it. Frequent NZ Classic Festival visitor, Sammy Miller tries the ’50 Works for size. Norton enthusiast and author Dr George Cohen inspecting closely. Because the 25 minute race on each day has to have two riders, both have to take part in the 30 minute practice. We put Kevin out first with Rodney taking over after 15 minutes. Kevin was getting used to the bike which had the standard Norton gear change on the right hand side and was lying 4th fastest when disaster struck. Getting into the chicane entering the front straight Kevin got into a slide and locked the rear brake and went flying. The crash was captured on the track side cameras and shown on all the big screens around the track. It really did fly, but luckily Kevin walked away unharmed. My initial reaction was it was not fixable as I had brought few spares, but we got stuck in and repaired the footrest, gear pedal and handlebar. Just by chance we had a spare brake lever, but the fast action throttle was badly damaged on top so I went looking for a spare. No luck so some serious repair work was undertaken by out team and we made it work. It is now definitely one for Rodney O’Connor’s dad’s collection. He is the importer of Tommaselli throttles, etc. The seat, tank, cowl and mega all suffered damage (sorry, Steve) but not enough to stop us! The organisers were all keen to get us out in the race tomorrow, and as Rodney had not qualified they allowed him to go out behind the pace car that clears the track between events. This was the first sighting of the track for poor Rodney so not ideal but at least we are in the race. We ended up 9th fastest qualifying so Down, But Not Out!! But wait, there’s more! 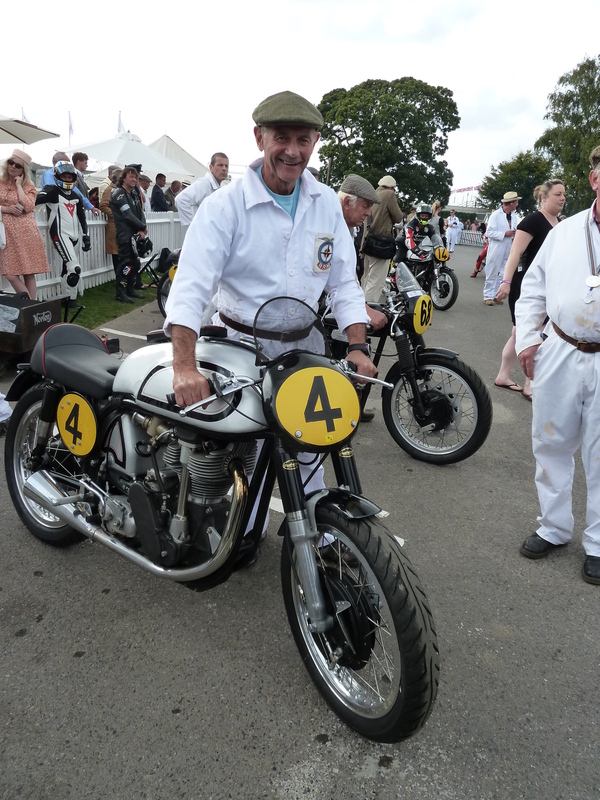 Off to Goodwood Revival with Kevin Schwantz and the only surviving 1950 “Works” Norton. The Isle of Man bikes were all packed into their crates at Fred Walmsley’s last Wednesday with of plenty assistance from my helper from NZ, Corrie Logan. After a quick phone call both bikes were picked up by Mike Farrell’s trucking company to be taken to Felixstowe and return to NZ by ship. All the freight people including Air Transport World Freight in NZ, Imorex in the UK and Farrells Trucking have all been absolutely excellent. After the fantastic result by Bruce Anstey at the Isle of Man Classic TT Debbie and I are off the the Goodwood Revival on the 13th and 14th September with Moto-GP superstar Kevin Schwantz and co-rider Rodney O’Connor from NZ. 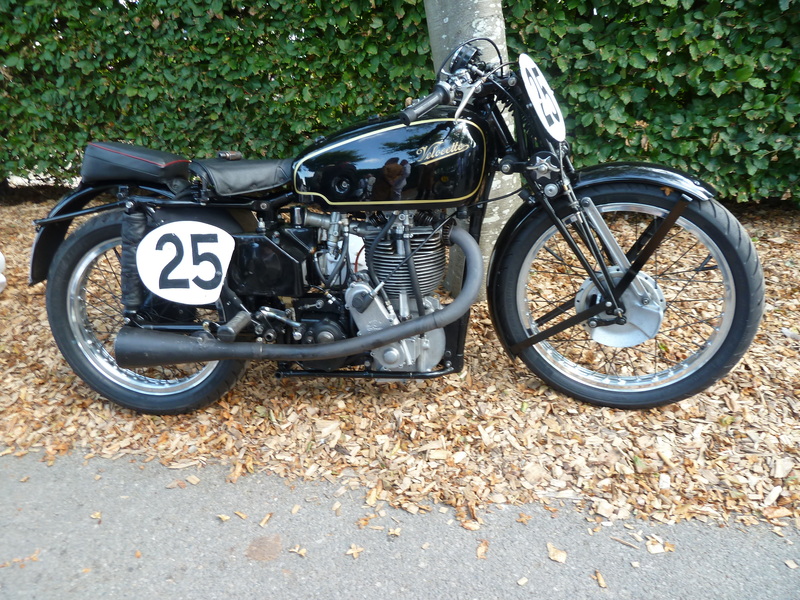 After a 25 year hunt for parts and a 4 year restoration, our little team at McIntosh Racing have finally restored the only surviving 1950 “Featherbed” Norton to full racing condition. In line with the bike’s status as “the bike that re-defined motorcycle handling forever” and made a young Geoff Duke the UK “Sportsman of the Year” , World Champion Kevin Schwantz has agreed to race this bike which will be seen in public for the first time in 64 years. The owner Peter Bloore, a Kiwi, came to the UK in the late 1960’s to work as a racing car mechanic and founded Race Parts UK Ltd. He found the bones of the bike scattered far and wide. The 1950 “Works” Nortons were all broken up to build the 1951 bikes, but some of the original parts were still around. All except the elusive Rex McCandless designed and built “Featherbed” frame (so named because 3 times TT winner Harold Daniel declared the bike so comfortable it was like riding on a “featherbed”). Peter Bloore found the rather rusty and bent frame at an autojumble and quickly realised it was a bit special. The discovery and purchase of a correctly numbered 1950 Works engine meant the project was viable as a restoration. This has been the biggest restoration project undertaken by McIntosh Racing and this bike is the “Missing Link” in Norton racing history. 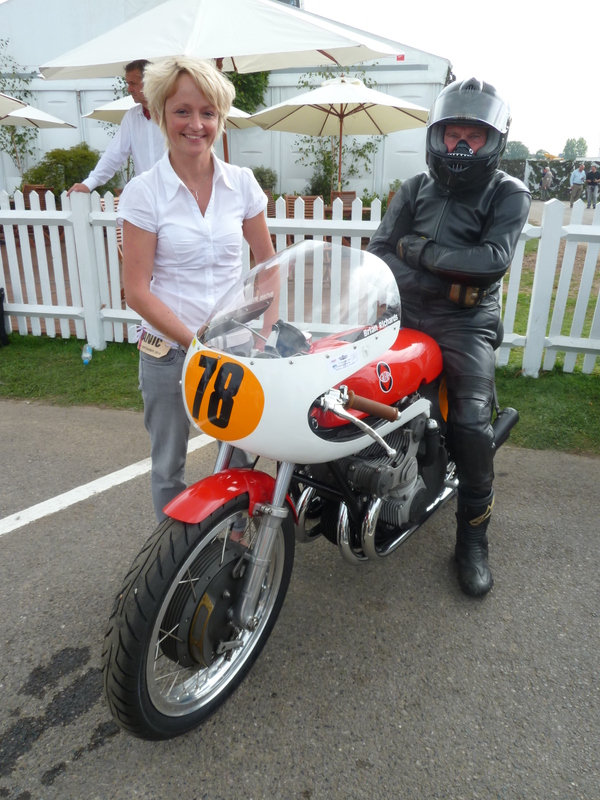 100,000 people attending Goodwood and a World Champion riding. No pressure then! New Zealand’s own World Champion being the first person to track test the 1950 “Works” Norton in 64 years at Pukekohe last month. 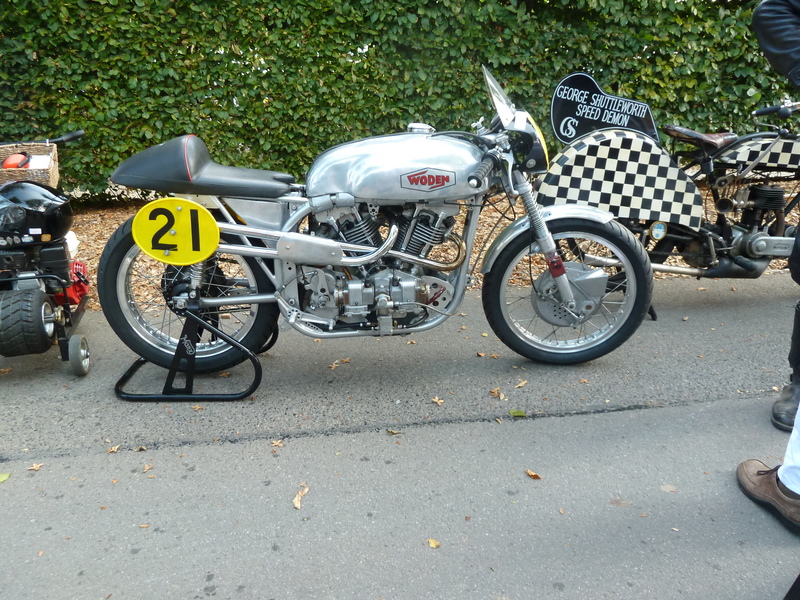 Bruce Anstey’s Hailwood Trophy winning 1962 Spec “McIntosh Manx”, with the newly restored 1950 “Works” Norton. After all the excitement of the 11 days spent on the Isle of Man we are now in Sudbury in Suffolk and a chance to say a big thank you to all the people and companies that have made this “Kiwi Challenge” a success. First to Bruce Anstey who is a real Kiwi hero plus a great ambassador for New Zealand and the Sport of Motorcycling. Bruce has managed to make everybody his fan, and is constantly nice to be around. 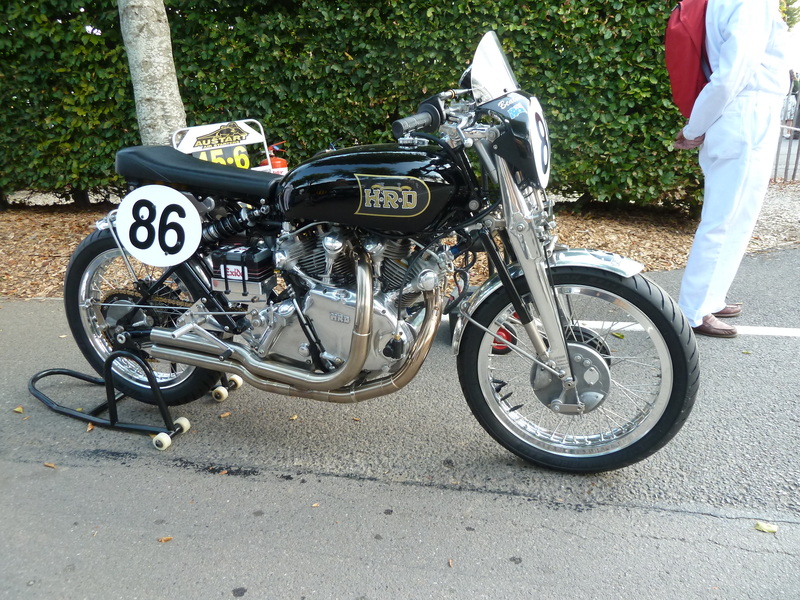 He rode a perfectly judged race to bring the Norton home with a cup of fuel left in the tank and the bike so clean and in such good condition it looked like it had done one lap, not four! It really looked like it could have done the race again if you refueled it. Our primary goal was to win “The Hailwood Trophy” and he did just that. Thanks Bruce. Job well done! Secondly to my mechanics Roy Norgrove and Corrie Logan and helpers Debbie and Brenda, who all came with me last year and with no prompting all came back to settle some “unfinished business” on the Isle of Man. Our little team worked extremely well with us knowing a lot more about what to expect. We got through some long days and bad weather with good humor and without any disasters. Thank you to Nick Worthington for lending his brand new “Schwantz/Anstey Spec” McIntosh Manx. He simply said “he thought it would be great to have Bruce Anstey ride his bike around the IoM”. The “two bike” approach was untried and I said to a lot of people that it might turn out to be twice as much trouble, but it worked very well. The practice last year went a lot more smoothly and we had a few bothers this year that we had to resolve. Bruce never lost his enthusiasm or complained, which kept us focused, and we all worked together to solve the problems and potential problems as they arose. The Isle of Man organisers,headed by Paul Phillips, Bruce Baker and “Milkey” Quayle were all really nice to deal with and never let us down. Having a TT Superstar rider like Bruce certainly helps but their whole Isle of Man Classic TT team dealt with any request and solved every problem. Thanks guys! We even got invited back again! Fred and Jacqueline Walmsley opened their home to us and although Fred was “head down” looking after Michael Dunlop and Michael Rutter’s bikes this year he still found time to help me when needed. The freight for the bike was perfect with the guys from Air Transport World Freight in NZ getting the bikes to UK on time, Imorex in UK clearing them through customs and Mike Farrell from Farrell’s Trucking delivering them. Everything went like clockwork. The new NZCMRR Inc president, Kevin Grant had a hand in getting the documentation just right, and that was a real help too. These two bikes were built in my workshop by Pete Welch who has worked for me for over 32 years, with help from Barry and David, and it is a testament to their good work that both bikes never missed a beat, nothing broke, (other than a $2 needle clip in practice), or fell off and they are both returning to NZ ready for their next race. We had some great product support in the UK from Summerfield Racing who supplied the engine, Avon Tyres, Amal Carburettors, and VP Fuel, and from New Zealand, Regina Chains, TT Industries Gearboxes and Mobil 1 synthetic oil. The financing of this venture was always going to be difficult and I was totally blown away by the generosity of the people who have supported me in getting to the Isle of Man. These people include: The Isle of Man Classsic TT organisers, Allied Lubricants NZ (Mobil), Mike Snelgrove of Flatout Riding Classic Motorcycle Tours, and also private sponsors including Grant O’Malley, Chris Greive, Michael Thomson, Doug Rikard-Bell, Toshi Maki (Japan), George Lewis and Sam & ET Jupe, plus some anonymous supporters. There are a bunch of other people like Steve Roberts (tanks), Brian Meadowcroft (paint), Tom Morriss (wheels) and lots of others who all supported this project by giving my jobs priority and special attention and I think the success was shared with everyone who contributed. “Thank you” to you all! Problems! No cigar this time.